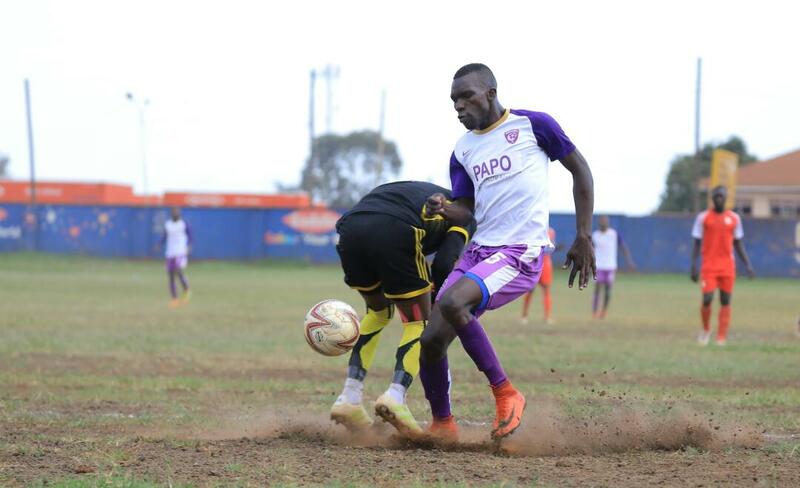 BUGEMBE – Wakiso Giants were held to a 0-0 at home to Kyetume in the FUFA Big League. In one of the 9 games played on Thursday, chances were few and far in-between with the best falling to Wakiso’s Norman Ojik who missed the target by a whisker, three minutes from time. The on-loan Police FC striker found himself just a few yards from goal after he was played in by a wonderful Feni Ali low cross from the right but side footed his attempted tap in, agonizingly wide of the right hand post with the Kyetume goalkeeper Ismael Ziiwa beaten. Ten minutes into the game, Ojik found the back of the net after robbing Ziiwa but was judged to have been in a offside position as Kasibante played him in with a looping pass. Kyetume who looked lively in the first half had their first sniff on goal two minutes later but a snap shot from outside the area was saved by Yasin Mugabi who dived low to his left. On 20 minutes, Yasin Mugume received a pass from Feni, beat two defenders but blazed over from just inside the area. Nine minutes from the interval, Paul Opedun shot strongly from outside the area but his curling effort was expertly pushed out for a corner by Mugabi. Three minutes later, Hakim Ssenkuba curled a free kick after Mugume was fouled 25 yards from goal but the former KCCA FC midfielder’s attempt went straight at Zziwa. On 41 minutes, Wakiso caught Kyetume on the break, Duff Lubobi tried to play in Karim Ndugwa but Brian Ngawaki intercepted the attempted through ball, nearly putting through his own net but was relieved to see the ball sail wide of the target. Both sides made several substitutions in the second half which was dominated by Wakiso with Mugabi looking more of a spectator but neither could find the back of the net. Wakiso looked comfortable in possession especially after Ivan Kiwewa came one for Ndugwa in the 58th minute but the log leaders could not create Clear cut chances. The game defining moment came on 87 minutes but Ojik failed to capitalize as he wasted the best opportunity in the game. The draw means that Wakiso maintain their six points caution atop the Elgon Group standings having gathered 33 points from their 15 games. Wakiso are still unbeaten in the League with 9 victories and 6 draws. Fro Kyetume, they now have 28 points with only 5 games to play.